Last week, I introduced my “Stroller 101 Series” in which I’ve set out to share insight I’ve gained about stroller running to help folks understand how I make it happen — but also provide some tips for getting started for anyone who is considering hitting the road with their little one (or ones!). Just like in part 1, I will begin with a quick disclaimer: this is not a sponsored post, nor am I, in any way, affiliated with any of the mentioned companies or websites. All opinions and insights are my own. So with that having been said – let’s get to it! 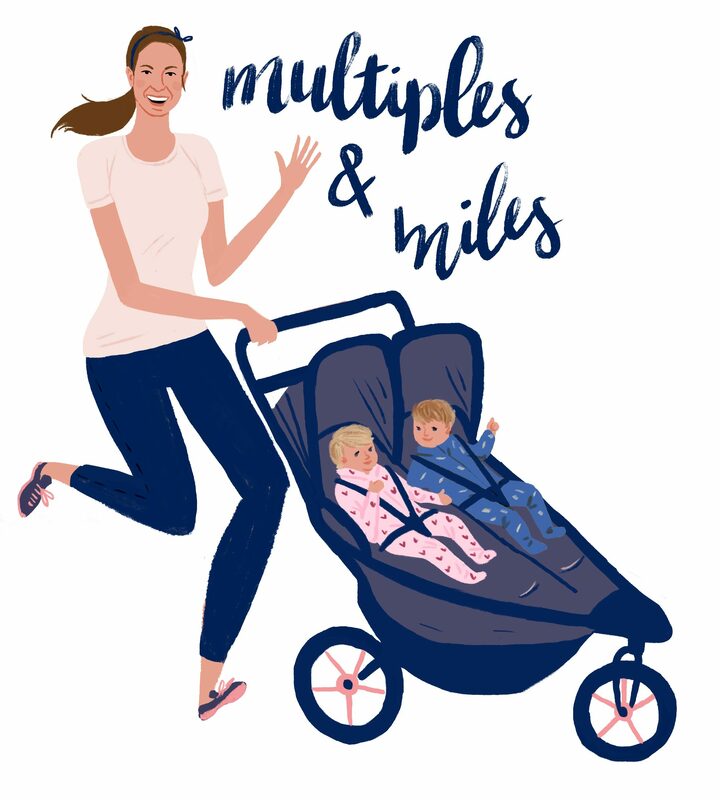 Here’s Multiples & Miles’ Stroller Running 101 Part 2! Check Your Budget. Running strollers can be expensive – especially when you take into account how much other stuff you’ve probably already bought for your baby – so take time to consider how much you really think you’ll use one. Of all the baby gear we’ve purchased so far, our jogging stroller is definitely one I could not do without. Using it is the only way I can fit running into my day (the alternative is waking up at 5am to clock my miles before the babies wake up — never going to happen). The Rev Pro Dualie is top of the line, and it was pricey – but I run with it 3-4 times a week, so to me it’s worth every penny. Plus, it pushes like a dream and is really sturdy so I know/hope it’s going to last many many miles.But, if you’re not willing to pay top dollar or you think you’re only going to use it once a week/month, check out a cheaper model – the BabyTrend Expedition starts around $100! There are jogging stroller options for a range of budgets. Additionally, scour CraigsList or your local NextDoor.com board, you might be able to score a used one. Also, if you’re really on the fence, see if a neighbor or friends has one they’re willing to let you try before you buy! Kick the Tires. Just like a car or a bicycle – your running stroller will need a tune up every now and then! My Dualie has a squeaky wheel that needs some grease every now and then, and I make sure to check the tire pressure every few weeks. Properly filled tires will make a HUGE difference – you’ll have to push so much harder when the tires are under inflated. I made that mistake once – never again! Getting a tune up at the local service station! Give me a Brake! Most running strollers come equipped with a hand brake and wrist strap – to help prevent a runaway stroller. But not all. If you plan on running a lot with your stroller in hilly areas – I would advise opt-ing in for these features. They are especially useful when running in the city for stopping at intersections as well as down steep hills or ramps. I squeeze mine intermittently on downhills just to make sure the stroller stays at a safe pace and I don’t lose control. Plus, I find that using the handbrake saves me a lot of effort and helps me hold my form since the brake is helping to slow the stroller down, not me having to physically restrain it. I could imagine that without a handbrake I’d have to do a lot of gripping and stutter-stepping to get down any hills. My knees hurt just thinking about it. Also, on the topic of braking…when you stop – even for a quick sip of water or to take a peek at your passenger – engage the parking brake and make sure it’s locked before stepping away from the stroller. I’ve noticed sometimes mine doesn’t catch right away so be sure yours has before letting go. To Lock or Not? – This goes against the safety manual for my Dualie (and most other running strollers I’m sure), but I’ve found locking the front wheel isn’t necessary and honestly I find it’s much harder to run with the wheel locked than not. Keeping it unlocked makes for an easier run because you can steer without lifting the front wheel. But be mindful if you’re going really fast and/or are running on bumpy sidewalks — the front wheel can get caught and the stroller could flip. Next week I’ll share the final part of this Stroller 101 Series – I can’t wait! Feel free to ask questions or share thoughts in the comments below. Did anyone buy a stroller after last week’s post? Did anyone head out for their first run with their stroller? How did it go?